calculated for orders being currently displayed (plus orders being hidden behind the limitation of a window display number, but meeting same filter criteria). 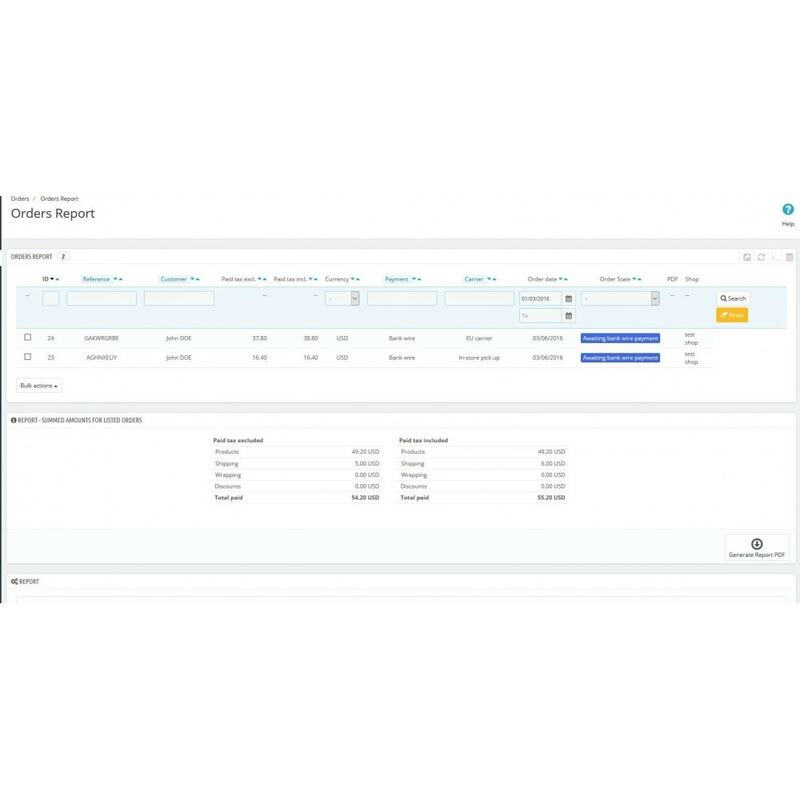 You can filter orders and create specific reports, using filter keys simultaneously, e.g reports for a specific customer, date interval, order state, shipping carrier, payment method and similar. If there are orders with different currencies in the list, separate REPORT is made for each currency. List of orders with report can be exported to PDF file. Details on search filter are written to PDF, so it is clear what search filter was used to generate the report when PDF is printed or sent to 3rd parties. 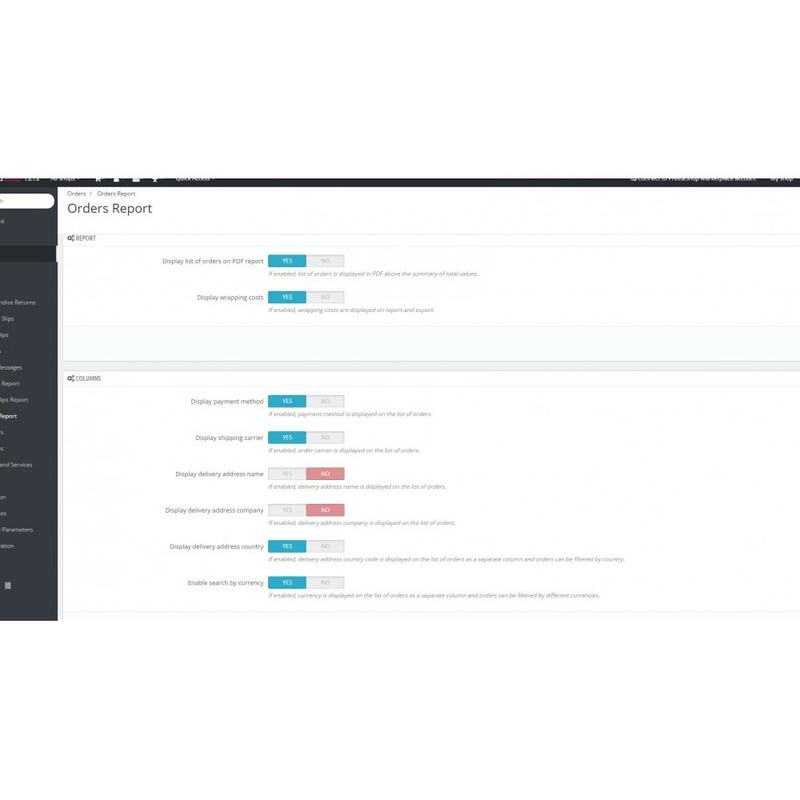 Order status pre-filter selection enables you to display orders with the same statuses. 'Waiting for cash on delivery'. You have to check these three statuses in the form 'Order State' and click 'Save'. Now, only orders that match checked statuses are listed. The report calculation is performed for the listed orders only. 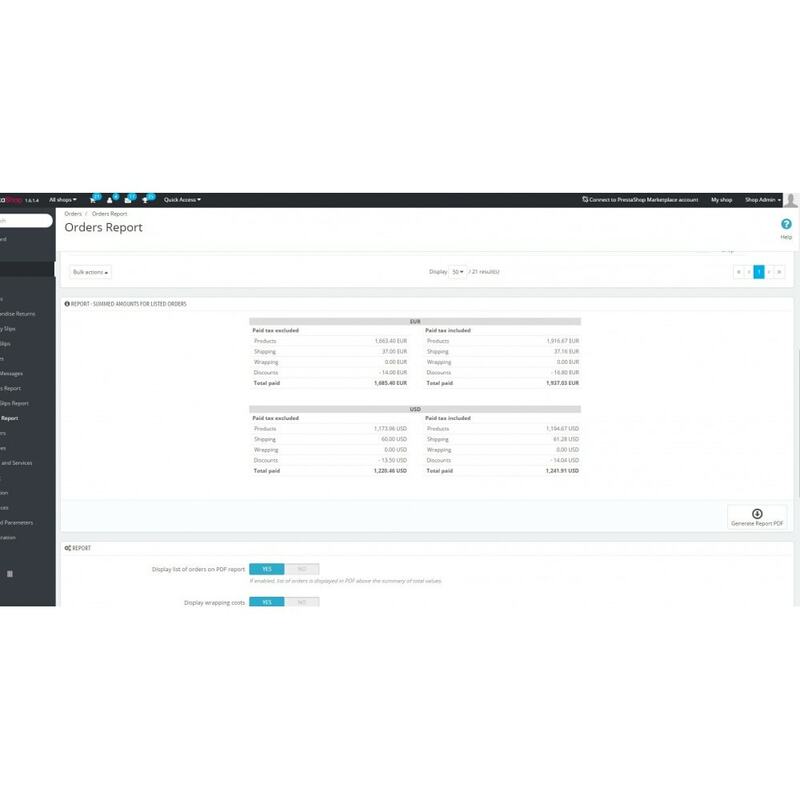 By using bulk actions menu at the bottom of the list of orders, Invoices can be created with one click by clicking 'Generate Invoice' button. If there are orders on the list already having invoice, they are skuipped automatically. 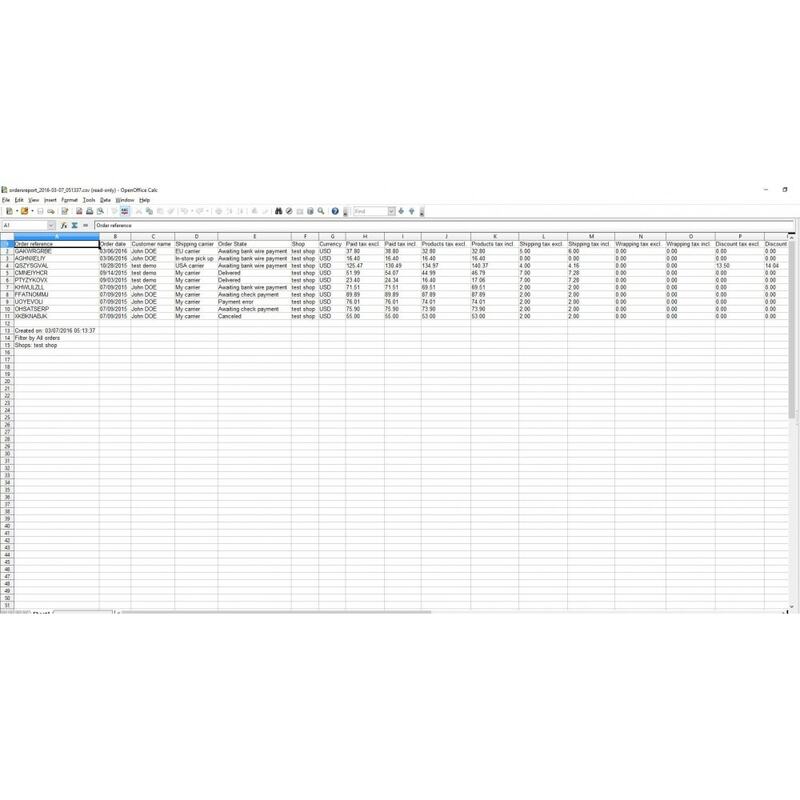 List of Invoices CSV file. Data can be imported from CSV file to Excel or Googledocs sheet or any other CSV supporting application, to further process your data. Order cart rules [if enabled in options] If more then one cart rule was applied to a single order, cart rule names are listed in a single exported column separated by a semicolon (";"). Script execution time - with this option, execution timeout can be set to longer time then default PHP value of 30 seconds. You can set this option to genarete PDF reports with very large number of listed orders. 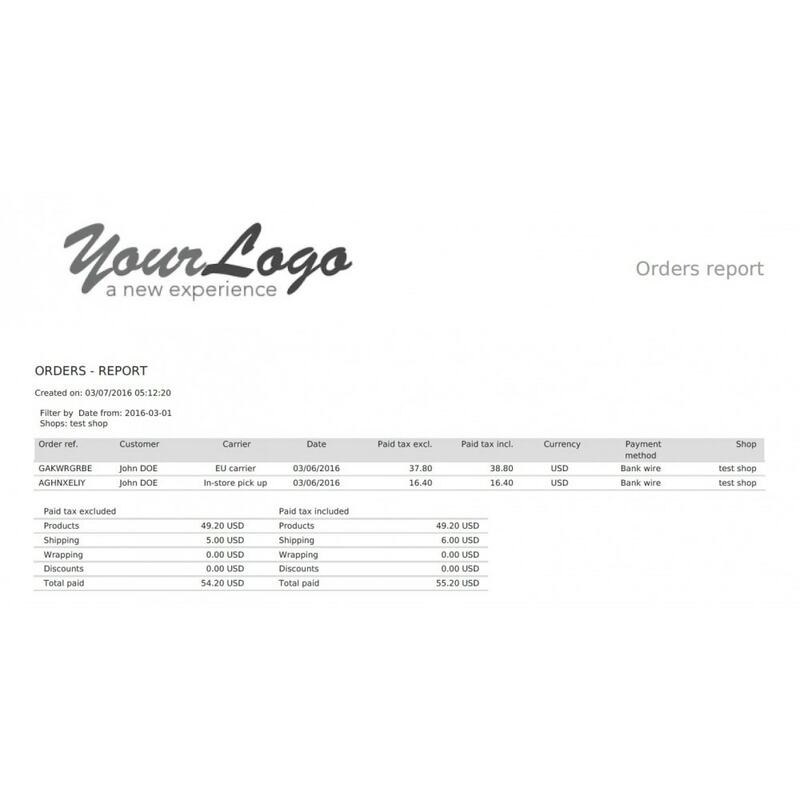 You customers can get detailed report on order for their purchases. Note: This module does not provide any front office functionality directly accessible to your customers. But you can for example inform your customer that report on their orders can be sent to them on request by sending them PDF or CSV file.